When you have an alien baby only "face huggies" will work. When Todd Cameron found a chestburster figurine — you know, that creepy, snakelike fanged creature from the "Alien" movies — at a garage sale, he immediately bought it. He and his wife, Nicole, love Halloween, and with their first baby due mid-October, he figured they’d use it somehow. That’s when inspiration struck to stage an epic maternity photo shoot featuring the baby alien. The two enlisted the help of their friend, Li Carter, to take the photographs. 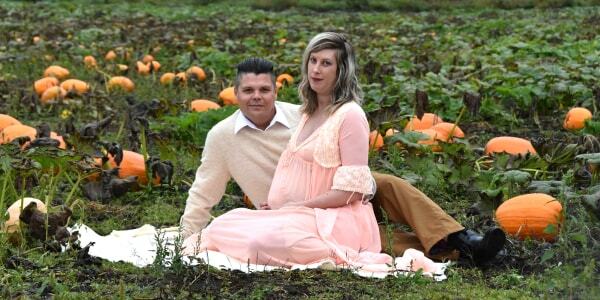 On a rainy fall day, Todd and Nicole went to a nearby pumpkin patch. She wore a long flowing pink dress and he wore brown pants and an oatmeal colored sweater. The setting looked perfect for fall pictures. After a few traditional pictures, Nicole falls onto the ground, grimacing in pain as if she’s in labor. Suddenly, the chestburster tears from her body and blood squirts out. “The basic idea was to tell the story and it starts off with this is another maternity shoot. Oh it looks like something is happening. A birth? Or something wrong?” he said. “We had to do a couple of takes. It was raining and we were laughing." Nicole, 36, is due in five days, and was barefoot lying in the mud as Todd prepared the big reveal when the alien tore out of her chest. Their attention to storytelling paid off: Since posting on Tuesday more than 125,000 people have liked it and almost 300,000 people have shared it on Facebook. Todd feared that many would skip over the pictures if they thought they were ordinary maternity pictures so he teased the surprise. “Well, you won’t believe what happened yesterday DURING OUR MATERNITY SHOOT!!! Our chests are bursting with love for our new addition,” he wrote in the viral Facebook post. While he wanted it to be a fun discovery, he also did not want his family to get the wrong idea so he warned them. “I didn’t want to get anyone’s hopes up,” he said. The couple have enjoyed the response to the photos and look forward to future costume ideas with their new baby.